The Hecate Chasma quadrangle (V-28) extends from lat 0° to 25° N. and from long 240° E. to 270° E. The quadrangle was mapped at 1:5,000,000 scale as part of the National Aeronautics and Space Administration (NASA) Planetary Geologic Mapping Program. Hecate Chasma is an extensive rift system consisting of multiple branches that lies in the lowland region of Hinemoa Planitia in the northern hemisphere of Venus. Here, we use the term rift and chasma (plural chasmata) to designate the trough and fracture zones that make up the Hecate system. Lineaments within the Hecate rift system that define Hecate, Zverine, and Hanwi Chasmata are mapped in red for emphasis. The system consists of several rifts and fracture belts, low-lying plains units, coronae and numerous small volcanic edifices including shields, domes and cones. The three branches of the Hecate rift system in this quadrangle are Hecate Chasma (centered at lat 18.2° N., long 254.3° E.), Zverine Chasma (centered at lat 18.5° N., long 271° E.), and Hanwi Chasma (centered at lat 10.5° N., long 247° E.). The quadrangle also contains many intermediate to large volcanoes, including Polik-mana Mons and Nazit Mons. Eighteen coronae are located in the quadrangle, the largest of which is the 525 km across Taranga Corona, along with fourteen impact craters. Corona maximum widths are measured to the outer edge of the annulus. Lineaments that form the corona annulus are mapped in green for emphasis. The overall topography of V28 consists of plains located slightly below mean planetary radius (MPR, 6051.84). The lowest regions are found in the rift trough (3.3 m below MPR), and the highest along the rift rim (4.3 km above MPR). 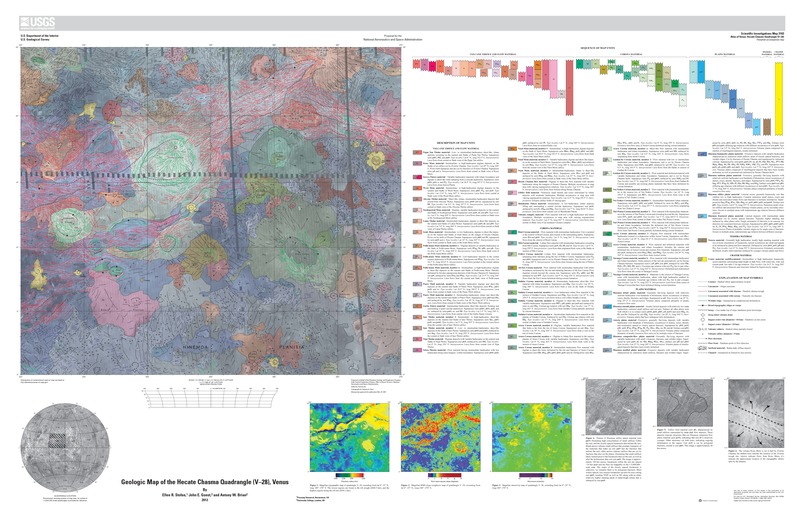 The regions that are the roughest at Magellan radar wavelengths in the quadrangle occur along Hecate Chasma (root mean square [rms] slopes >10°), with most regions being relatively smooth (roughnesses comparable to the average Venus surface value of 2.84°). Emissivity values in the quadrangle are typical of most venusian plains regions, with a range in values for the quadrangle of 0.68-0.91. The highest emissivity values in the quadrangle lie at the highest elevations in the quadrangle (corona rims and interiors).